I first climbed Mt. 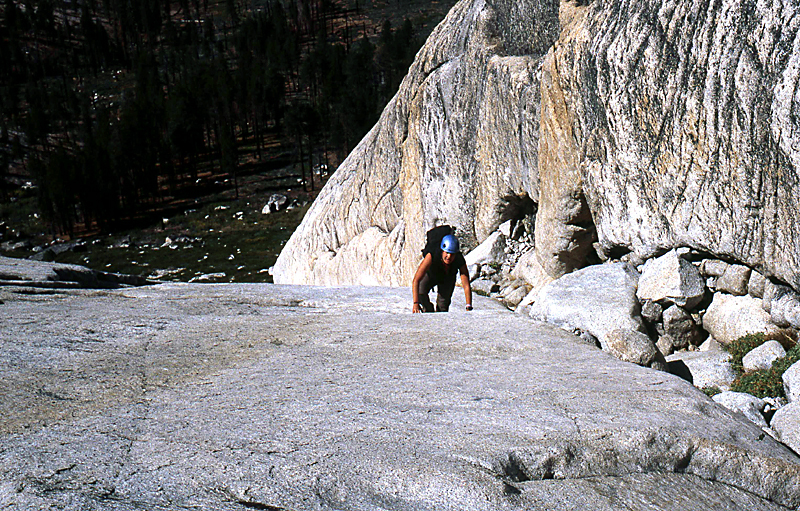 Starr King as a neophyte climber back in 1981. I have fond memories of that climb, being both a really long day (I started down in Yosemite Valley because I wanted a greater challenge for some now unknown reason) and one of my first difficult climbs. I managed the feat nearly intact even though I climbed it solo in tennis shoes without any protection. Back then, I don't think rock climbing shoes had been invented yet, and I would not have known what to do with a rope if someone handed one to me. After some musings about going to Starr King by some climbing acquaintances, I decided I wanted to revisit this magnificent hunk of granite. It turns out Samantha also had her eye on this peak, as it was the most difficult climb her father had led some 30+ years ago. Even though Samantha and I work in the same building in Sacramento, we seem to run into each other more often on some random Sierra mountain than we do at work. So it didn't seem unusual to climb the same mountain on the same day again, the only difference being we started from the same place at the same time. Mt. 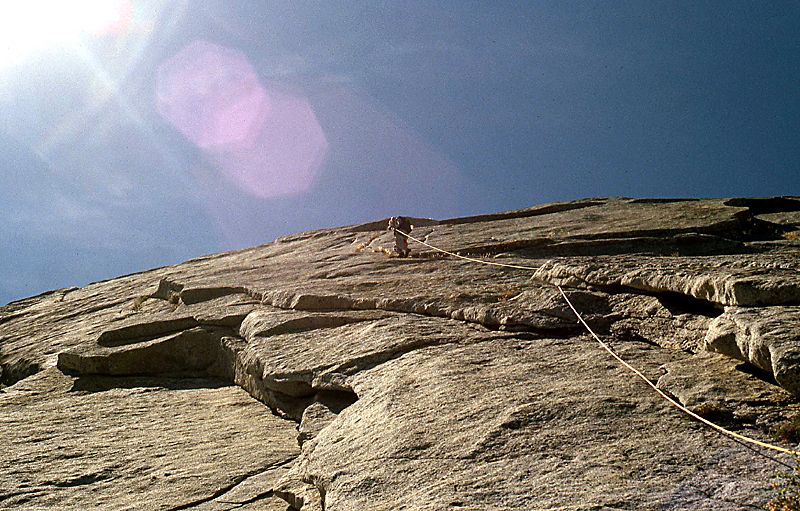 Starr King is THE classic friction climb on the Sierra Peak Section (SPS) List. It is not so much a mountain, as it is a massive, smooth-sided dome. 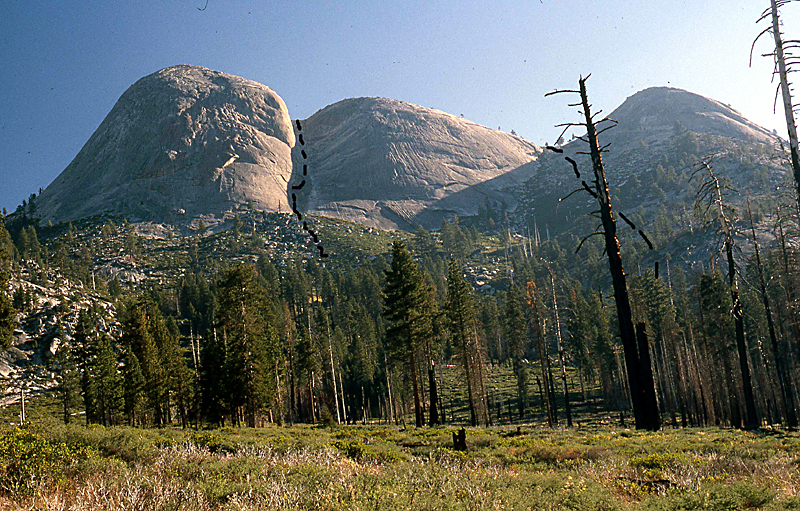 Other domes on the List, such as Tehipite Dome and Half Dome, either have a rather short friction move (e.g., TD) or have cables that anybody can climb (e.g., HD). Eschewing the death march approach of starting from the Valley floor, we started from the Mono Meadow trailhead at 7300 ft. My TOPO software pegged the round trip distance to Mt. Starr King from this trailhead at 11 miles. The trail starts by going down through a meadow, mostly dry this late in the year, then down to Illilouette creek at 6400 ft. As we descended to the creek, we could see our objective occasionally through the trees. The creek was easy to cross on rocks in late summer. About a half mile after crossing the main branch of Illilouette creek, we took a direct line towards the dome climbing first through trees and then through brush. A fire had passed through the area 2-3 years ago, so the brush was fairly easy to negotiate. However, the brush is growing back rapidly and should just as bad as it ever was in a few more years. Samantha also observed that we were sporadically post-holing in the ash left by the fire, as the ash was still quite deep in places. My plan was to reach the base of Starr King via the class 2 route up the second satellite dome to the south. The crease, or gully, in the rock between Starr King itself and its first satellite dome goes class 3, but I was thinking keep it easy since we were in for some tougher climbing on the dome itself. Although I've known Samantha for only a short time, I sensed right away the easy route was not her preferred approach, not when there's some real climbing to do. So off we went for the class 3 gully. The direct approach to the gully resulted in some difficult bush-whacking near the base of Starr King. Fortunately, both of us were wearing long pants to protect our legs from the botanical assault. A less brushy approach appeared to be on the low ridge to our left, but we were committed now to make the direct approach work. Finally getting to the start of the gully, we donned our rock climbing shoes and headed up the left side. For those that enjoy class 3 friction climbing, this was a fun route and a good warm-up to the actual climb up Starr King itself. Much more interesting than the class 2 approach. We did encounter one short, very steep friction section about 150 feet up that took us more to the middle of the gully. We thought this part went more like class 4, or at least a spicy class 3. Reaching the SE saddle of Starr King, where the SE saddle route up Starr King begins, we took a short break and then followed an easy use trail over to the NE side of the dome. The NE side route is rated slightly harder (class 5.2) than the route heading up from the SE saddle (class 5.0). Since the NE side was the more difficult route, I got no argument from Samantha. 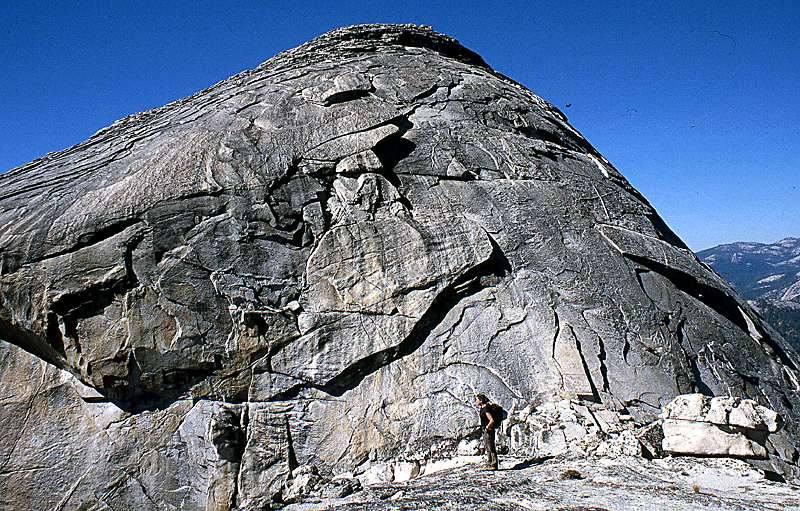 In the intervening years since I first climbed this dome, the NE side somehow became more difficult, with the rating going from class 4 (Steve Roper's climbing guide) to class 5.2 (Secor's climbing guide). My feeling is that the climb goes closer to class 4 with rock climbing shoes, but certainly class 5+ with typical hiking boots. Hiking boots just don't stick like rock shoes to the smooth, steep granite. The beginning of the NE route starts at the highest point of the interface between steep slabs and talus. Looking up this face, there are few obvious spots to place pro. This, plus the slightly higher climb rating, is probably why 90% of trip reports describe climbs via the SE saddle. I started up the first pitch trailing the rope and found the rock shoes stuck quite nicely to the granite. Better than tennis shoes, which I had used the first time I climbed Starr King. After about 30 feet of climbing, I found and followed a large vertical crack that went up quite some distance. This crack provided even more solid footing than the smooth granite. However, it was packed with hard dirt frustrating my attempts to use the few cams and nuts I brought. But the climbing was feeling solid so I just kept going up and didn't worry too much about protection. Pretty soon, Samantha was yelling from below that I was near the end of my rope. I think she meant this literally as well as figuratively because of the lack of pro, but I kept going up looking for cracks in the rock. Just as Samantha yelled that the end of the rope was going away from her, I finally reached a reasonable crack to jam two cams in. I would have to belay Samantha up from this exposed point, but the angle of the slope had eased off a few degrees giving my rock shoes a better grip on the granite. Looking up, I was only 15 feet away from a nice rock to throw a sling around for an anchor. I would have made it if I had a 60 meter rope, but mine was only 48 meters long. It used to be 60 meters. But that was before it got raked and frayed over a sharp rock edge during a rappel on Disappointment Peak earlier in the year. After Samantha reached my rather exposed perch on the side of the dome, a quick rearrangement of the ropes was made and off she went leading the second pitch. She threw a sling around the rock just above me, clipped in the rope and kept going. Again there was little opportunity above the rock anchor for sticking in pro, but the climbing felt secure with the shoes. Soon it was my turn to yell she was about out of rope. She replied that a nice rock horn was above her, but again, the rope was a little too short. So I took out the cams at my anchor and we moved together in protected simul-climb form for about 15 feet until she could reach the rock horn above her. This also happened to be the point I reached the first rock anchor that was 15 feet above me. Again, a 60 meter rope would have been just right for this second pitch. When I reached the end of the second pitch, we then ascended only 20 feet more of easy climbing and we were on the summit. 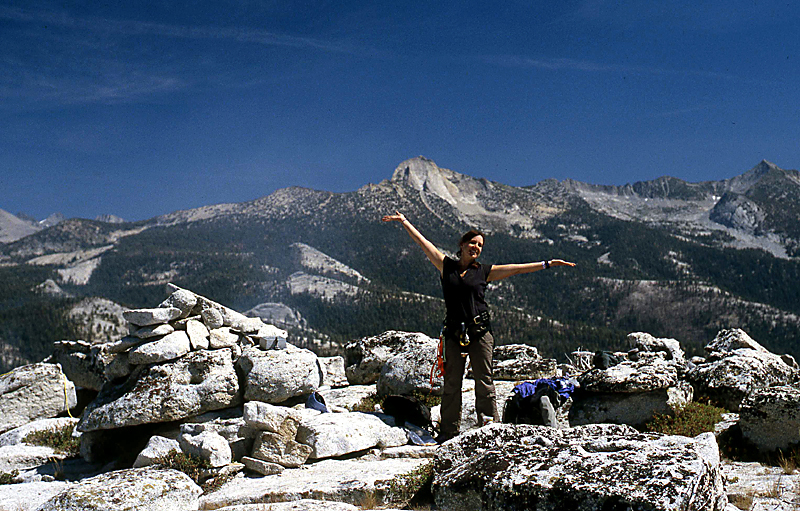 I was stoked to be once again on the peak that had started my life-long enthusiasm for climbing in the Sierras. For Samantha, it was the culmination of a long time goal to climb the peak that had meant much to her fathers' climbing achievements. One of the first things I noticed once I looked around was that the summit area seemed smaller than I remembered from 25 years ago. I guess everything seems bigger when you're young. My register entry from 1981, although barely readable, was still on the summit. One that day so long ago, an SPS group had just signed in the register before me and were apparently already on their way down the SE side. I had gone up the NE side, so I had completely missed them. According to the register, R.J. Secor was a part of this group although his name, let alone the SPS, didn't ring any bells for me then. When I poked my head over the SE side to see if they were still descending, sure enough, there was one guy left 30 feet down at the top belay station. When he looked up and saw me, he said with astonished amazement, "How did you get up there!" "I came up the NE side", I replied. After a brief moment, I then blurted out something I still regret to this day. I said, "How do I get down?" What a buffoon I was. I had been so intent on summiting, I didn't think about how I was right on the edge of my abilities. Getting down was going to be even harder. After a pause, the climber below said in a voice of complete disdain, "Good Luck!" And then he turned around and ignored me. No one else was going to hold my hand getting off Starr King. So ended my first encounter with the SPS. After a 45 minute stay, Samantha and I started back the same way we came up. Using the same rocks as anchors, we down-climbed on belay. The rope was not nearly long enough to consider a double rope rap, but the down-climbing went easier than expected. Samantha found a bomber crack to place nuts under a rock shelf near the end of the climb. This last 20 feet of the down-climb was the toughest section, where the rock was smoothest and steepest. Using every miniscule imperfection in the rock, and avoiding the densest patches of slippery lichen, we got down without a slip. This is one climb where getting down in good form was almost as much fun as reaching the summit. Back in 1981, my tennis shoes got me down this far without much trouble. However, they were just not giving me any stick on the steepest part. So I dropped into a barely controlled slide until I got to a small crack I could jam my fingers in to bring me to a stop. Obtaining only a minor case of rock rash, I was easily able to descend the rest of the friction down from here. When Samantha and I returned the SE saddle, we descended the class 2 route on the second satellite dome and avoided the worst of the bush-whacking opportunities. Retracing our route back to the car, we reached the trailhead at 5:30 pm for an 11 hour dayhike and roughly 3700 ft of total elevation gain. This was such a nice climb, I can't see why it took 25 years for me to repeat it. And I can't wait to go back again next year to try the 'easy' SE saddle route!